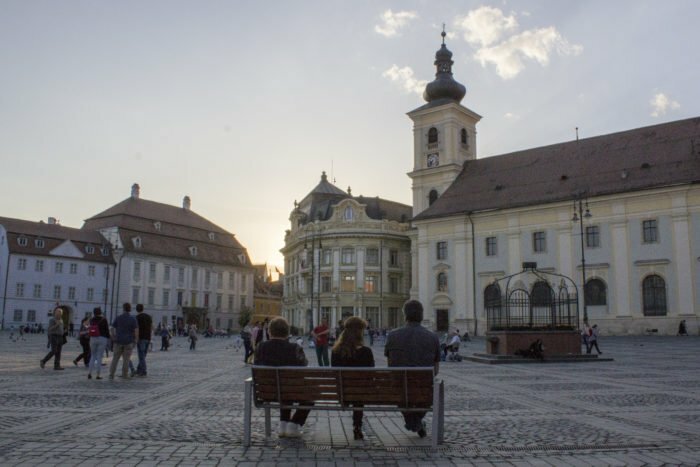 Novi Sad is a perfect weekend trip from Belgrade. The second biggest city in Serbia is colorful, cute, and definitely worth taking the time to explore. 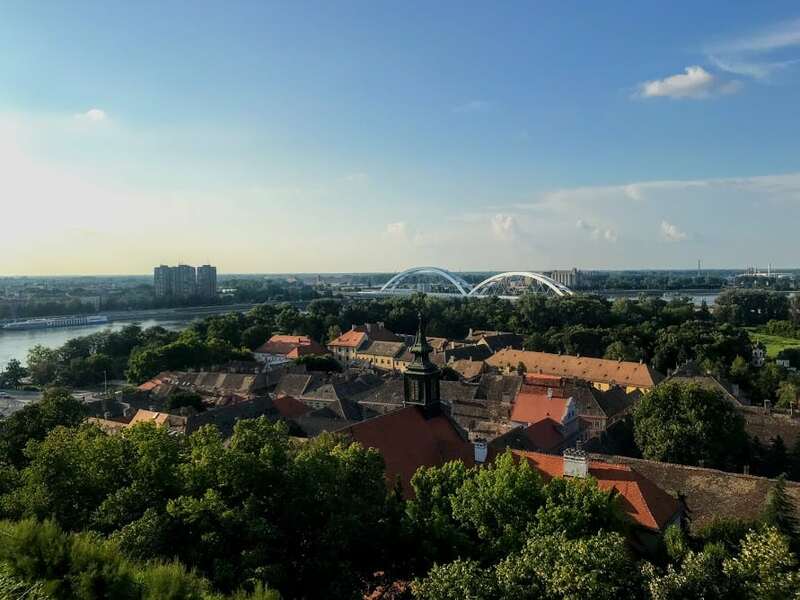 If you want to escape the city life on a weekend trip from Belgrade, then Novi Sad is the destination for you. Ready to go? 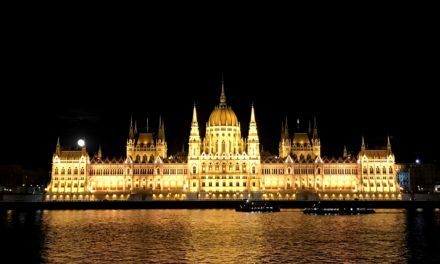 Here’s you need to know to make it happen from how to get to Novi Sad, what to do there, where to eat, and more! Let’s start from the beginning. First things first, how do you get to Novi Sad by bus? Daniel and I never travel with a car rental so I got ya covered. To get to Novi Sad by bus from Belgrade, you need to go to the Main Bus Station. If you’re staying in the center it should only be a 15 or 20 minute walk and you can skip the taxi. Walk into the bus station and you’ll see a huge row of ticket agents. Unlike most stations I’ve been in, there aren’t different stalls and bus brands to choose from. Instead, they’re all selling the same thing. You can go any time because busses to Novi Sad from Belgrade leave about every 15 minutes. You can see the exact schedule here but rest assured that if you show up during normal travel hours you’ll be able to hop on one quickly. The ride costs 750 dinar / 7.50 usd per person (this includes a token that you need to enter the platform itself) and the trip took us 1.5 hours exactly. Getting back to Belgrade is just as simple, just make sure you buy your ticket at the bus station and not the train station next door! We accidentally bought tickets for the train and even though it’s slower we thought well, why not. It was supposed to come at 1 pm and we waited until 1:30 but it just never showed. So we cut our losses (train tickets are 350 dinar each) and bought bus tickets. We were on the next one in 10 minutes and the trip home took 1 hour and 15 minutes. 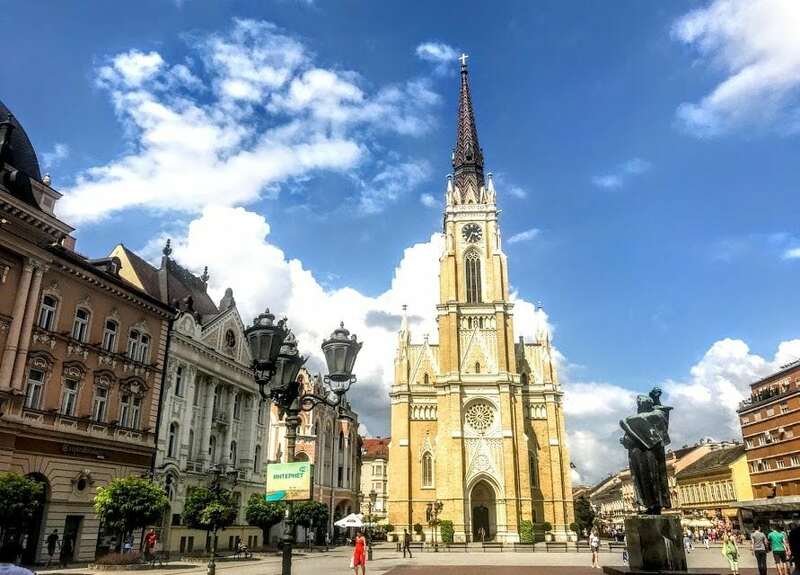 If you’re on a budget, Novi Sad is a great weekend trip from Belgrade because it”s much cheaper than the capital city. I couldn’t believe it, but Daniel and I snagged a private room in Alterna Home Hostel for only 2400 dinar / $24 usd. We went to Novi Sad on Friday afternoon and left on Saturday afternoon, so we only spent one night at Alterna Home Hostel but it was great. The location honestly couldn’t have made our weekend trip from Belgrade any easier and I definitely recommend it for your stay as well. Click here to book your stay at Alterna Home Hostel. Ok, so you might have noticed that this article was published in July. We visited Novi Sad on a super hot weekend so our plans weren’t too ambitious. It was more of a “let’s enjoy ourselves” trip and much less of a “let’s see everything!” type of vibe. 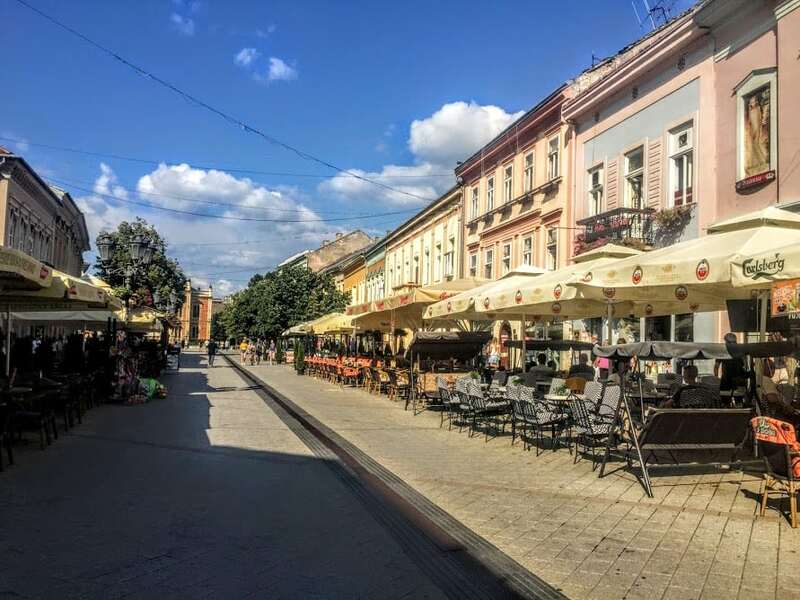 If you’re looking for things to do in Novi Sad, I’ll give you the rundown of what we did, and then offer additional advice for more activities that we considered but ultimately cut from the itinerary. You really can’t miss the main square because it’s the center of town. I love Novi Sad because the surrounding streets are all closed for pedestrians only which makes them perfect for exploring without traffic constantly whizzing past. On the right side of the main church, you should walk down Dunavska Street which is lined with colorful shops, cafes, and restaurants to try. 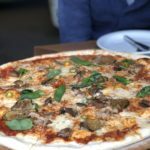 We had some great meals on our weekend trip to Novi Sad! Daniel had a craving for a hot dog for some strange reason, and when we searched hot dogs in Novi Sad (I know, how American can we get?) we discovered this gem called Tehnolog. It’s about 10 minutes walking from the center but so worth it because the hot and flavorful hotdogs were only 200 to 300 dinar / 2 to 3 usd each! Plus, they had tons of craft beer options and even some on tap. It was a perfect place to start the night with a hot meal and a few drinks. The next morning, Daniel and I were on the hunt for breakfast in Novi Sad. If you love a big meal in the morning like us definitely go to Petrus Cafe. It’s kind of fancy but don’t let that fool you the prices are still incredibly low. 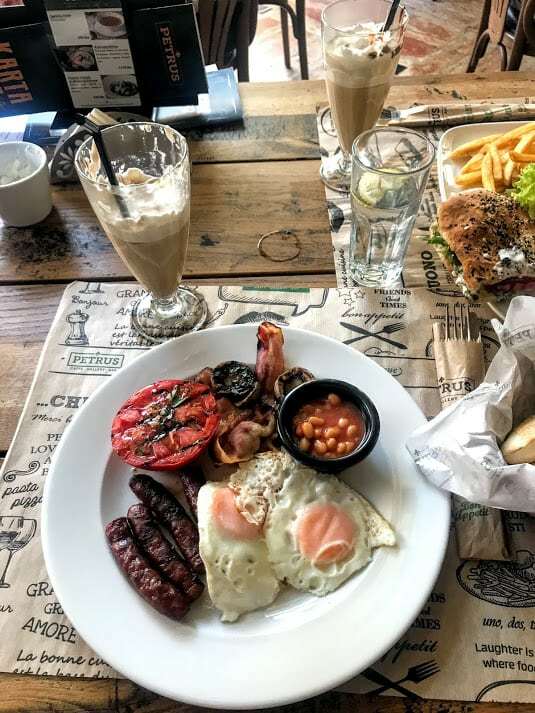 We had two iced coffees, water, a prosciutto sandwich, and a full English breakfast for only 1150 dinars / 11.50 usd. Crazy! And it was super tasty and right by the main square so pretty much perfect in all regards. For craft beer, definitely check out The Beer Store. There are 3 locations in the city and one is right downtown. They had so many craft beer options on tap and then plenty more bottles you can buy to-go as well. The central location is located right off the main square and only a few doors down from another craft beer place called Muzat Pub. If you want to try some Serbian brews (which I’ve been pretty impressed by so far) this is the best place to start. If you like to smoke shisha Novi Sad also has a good bar called Caffe & Nargila Bar Monro. The hookah was only 600 dinar / 6 usd which is a really good deal and the smoke was great. We also snagged a bottle of wine to go along with it for only 750 dinar / 7.50 usd. Such a cheap but great night out. The Caffe Bar isn’t in the very center so the ambiance isn’t spectacular but if you’re looking for good shisha I recommend it. There’s another shisha place called Horus Caffe right by the two craft beer bars that we wanted to visit, but it was full when we stopped by. If you take a weekend trip from Belgrade in the summer it’s going to be hot. Wait until the evening to visit the Petrovaradin Fortress because it’s open all night. The fortress is about a 20-minute walk from the center and the main draw is the views of the surrounding landscape. I’m not going to lie, I kind of think the area around Belgrade and Novi Sad looks a lot like Ohio with the river and the cornfields and the bridges and the flat land, but maybe that’s just me. The view is nice but not a “knock your socks off” situation. Still, it’s a nice walk and there are restaurants to sit down in and enjoy a drink or two before you head back. 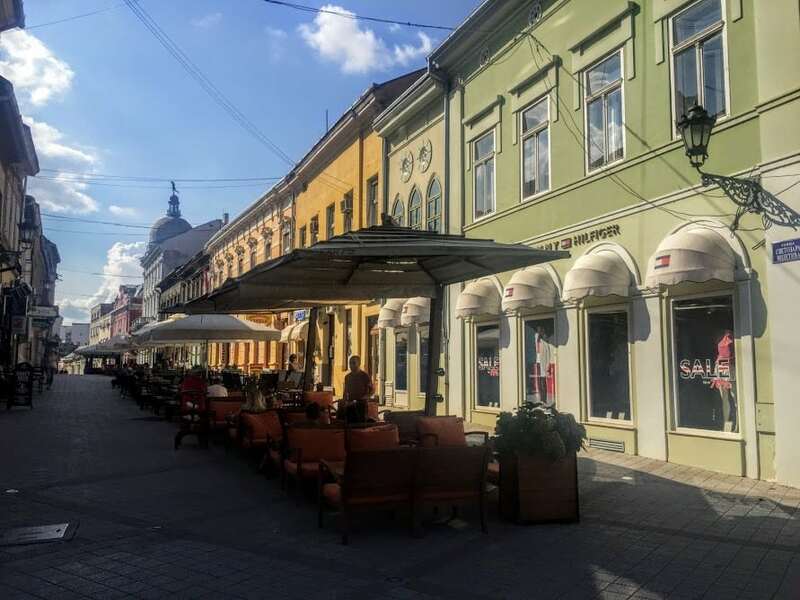 Now for the list of things we didn’t do because of the heat and time constraints (but mostly the heat) but you should still consider checking out on your weekend trip to Novi Sad. Fruska Gora National Park is one of the most popular in Serbia and it’s right by Novi Sad. 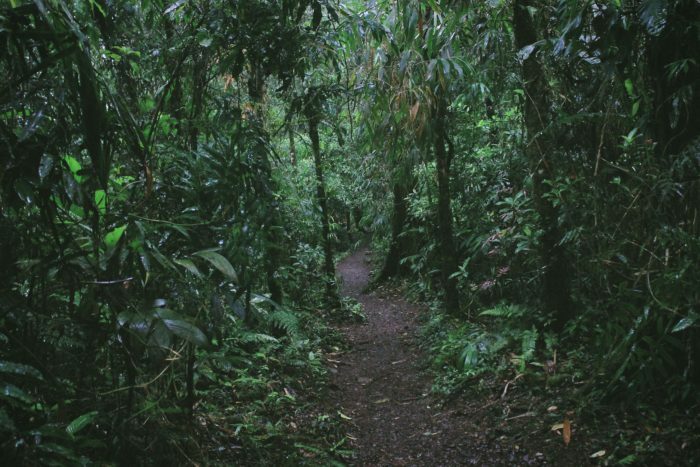 If you want to go hiking this website will be useful. 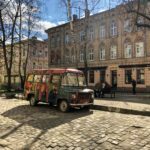 It lists all the different bus routes that will take you from Novi Sad into the park and what hikes you can do from them. This little town is built along the Danube River as well and our hostel owner strongly recommended it. Buses leave from the main bus station (check this timetable) and the ride takes about 20 minutes or so I’m told. At Sremski Karlovci you can explore the town and visit some wineries for a tasting before you go. The area around Novi Sad is famous for their monasteries, many of which are still active. 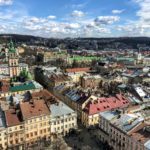 If you don’t have a car it will be tougher to see them, but you can still hire a tour online to take you to Sremski Karlovci and the most popular monasteries. Free walking tours are always a classic. It looks like the tour takes place every day between April and October but make sure you double check the Facebook page for the date and time before you do it. The more I travel, the more my travel style has changed. 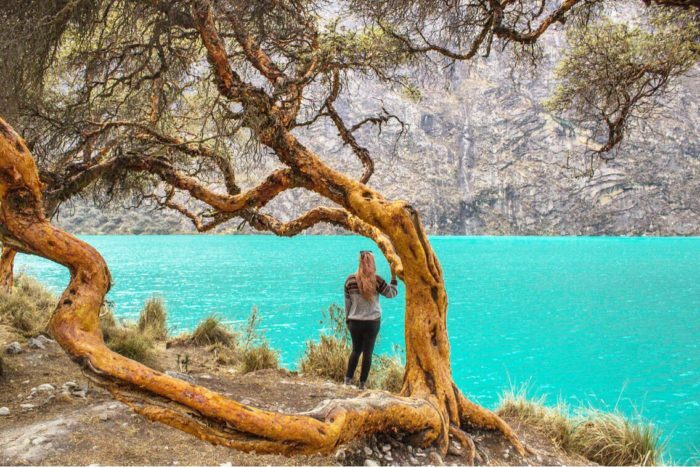 When I first went abroad I felt like I must see and do everything everywhere that I went. Now, I take mcuh more laid-back approach, with a focus on enjoying the moment and the day even if it means missing out on some famous sites or landmarks. Because of this new mentality, Novi Sad was perfect for an easy weekend trip from Belgrade. It required a short bus ride with zero scheduling issues (just show up and go) and the small town was cute, colorful, and fun to explore. If you’re looking for a quick and easy day or weekend trip from Belgrade I have to say I recommend this itinerary! Check it out to see more of Serbia outside the capital city and enjoy your trip. Ready to go? 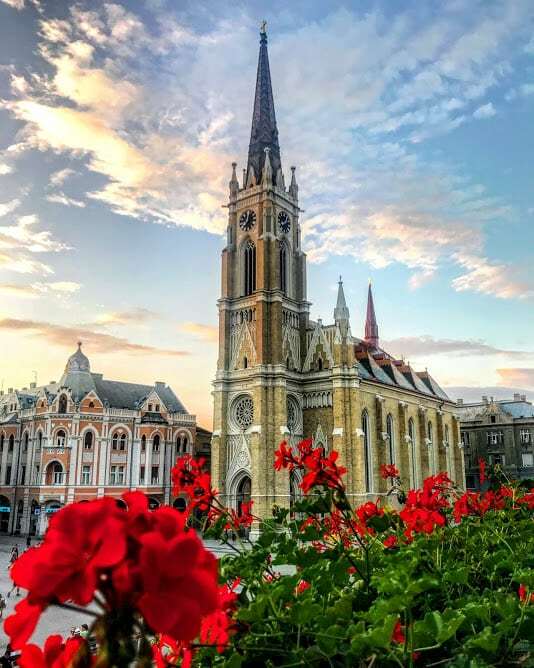 Click here to book your stay in Novi Sad! Plan the rest of your trip with the Serbia Series where you’ll find complete guides to craft beer in Belgrade, cheap eats in Belgrade, the best Instagram spots in the city and so much more! 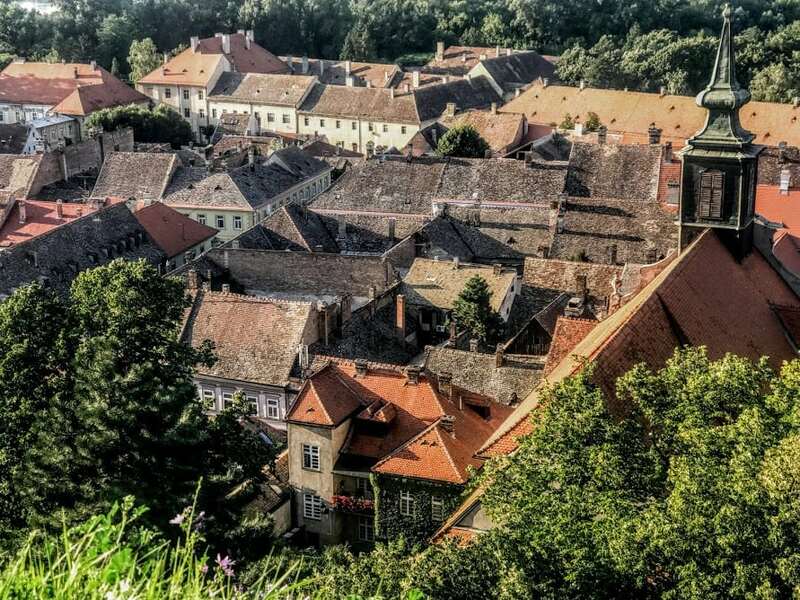 Buda vs. Pest: Which Neighborhood Should You Stay In?